On the final day of the 2018 European Championships in Berlin at the Breitscheidplatz plaza, there was an impressive ceremony during which Horst Milde, the “inventor” of the Berlin Marathon, awarded the medals to the top men in the marathon competition. It was both a great honour and recognition for the life work for the man of action, Horst Milde. He will turn eighty on October 24, 2018. A discussion with the chairman of the interest group German Road Races (GRR) increasingly looks more like a discussion of over half a century of the development of running sports in Germany. He initiated seven German championships in Berlin, including the German Cross-Country Championships, Marathon Championships, 10,000m Men’s / 3000m Women’s Championships, German Youth and School Relay Championships and between 1976 – 1984, several German University Cross-Country Championships within the SCC Cross-Country event. As a special trait, close friends often describe his capacity for foresight and vision, which has helped him to promote many new developments, look beyond the borders of his own events and learn from other races. Added to this was his ability to first wheedle his family, then friends and acquaintances into volunteering at the scheduled events as helpers and employees, thus over time building up a powerful and experienced team for the organization. Added to this was his important assertiveness to convincingly “knock at the doors” of mayors, administrations, police, licensing authorities and forest administrations – and before 1990 with the Allies in Berlin – in a way in which he was recognized as a partner in the interest of sport – and not as an opponent. and the inline skaters celebrated their debut in 1997 at the Berlin Marathon, the first event that offered inline skating as part of a major city marathon in Germany. Horst Milde, was not only an ambitious athlete (800 m personal best of 1: 49.8, and 2-time German relay champion in the 3 x 1000 m with SCC Berlin), he also was a trained master confectioner with an MBA, and worked in the family bakery, which was created in 1903 in Tempelhof. And in additional to all of that, he proved to be an excellent honorary organizer of (running) events. 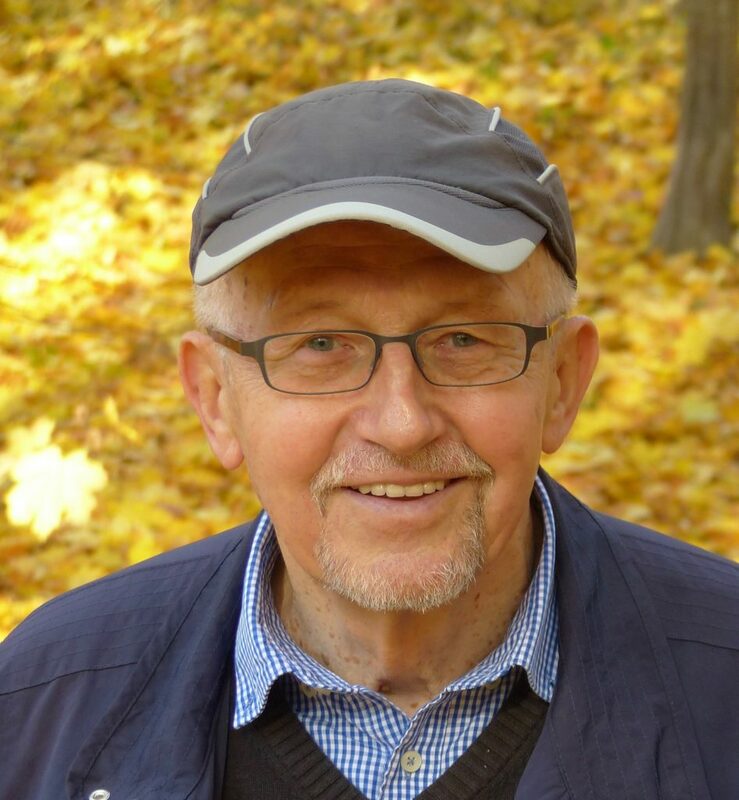 Together with the Sports Department of the Free University of Berlin (FU Berlin), he founded the first the cross-country run on Teufelsberg under the motto “Open to all of Berlin”. 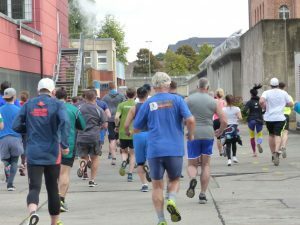 It was a premiere for a German running event, as it allowed non-club members to participate. Thanks to his work getting the word out, 700(!) 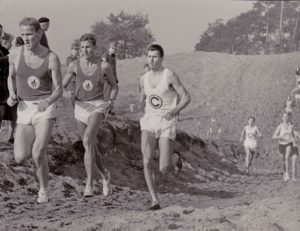 students, club and amateur runners romped on the Teufelsberg mountain in 1964. Ten years after the premiere cross-country event, Horst Milde, who by then was in charge of public running events for the Berlin Athletics Federation, organized the first Berlin Marathon in 1974 with a few volunteers – and 286 participants, with 244 finishing. The cornerstone of the Berlin Marathon was laid, even if the course in October 1974 was still far from any spectators in the forest area near Mommsen Stadium and along the Avus highway. “Of course we lacked experience, but our volunteers were enthusiastic. There were two water stations with salt tablets and hot broth in the finish!” remembers Horst Milde as he considers today’s culinary delights on the track and at the finish. And headded in the same breath: “And the invitation stated: Without training – no marathon!” Then and now, an important creed for the former middle-distance runner and event organizer. 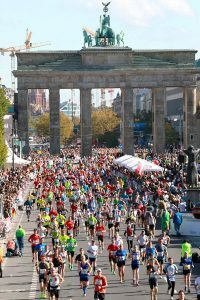 The rise of the Berlin Marathon came in 1981 with the move to the city center and the start at the Reichstag – and finish on the grand boulevard, Kurfürstendamm, and then in 2004 relocated to the Brandenburg Gate. And the race soon became a giant of the international scene. 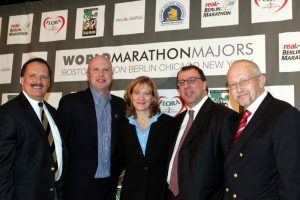 “I never dreamed of this development; unlike today, we did everything as volunteers, and I was always looking wide-eyed at Fred Lebow and New York City!” Now the Berlin Marathon, with its 11 world records, is the “market leader” of elite international marathon events. 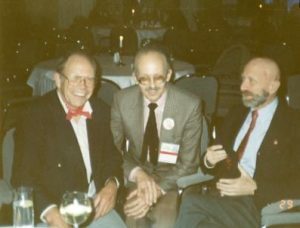 The „big players“ visiting the Berlin Marathon 1990: Chris Brasher (London Marathon) and Fred Lebow (right) (New York City Marathon) and Horst Milde (m). An unforgettable international athletic sensation of its own kind: The All-Berlin New Year’s Run took place on January 1, 1990 with over 20,000 participants from all over the world and leading for the first time in 28 years from Berlin (West) through the Brandenburg Gate to Berlin (East) and back. Before that, on November 12, 1989, three days after the fall of the Wall, the first Berlin (West) – Berlin (East) Reunification Run with participants from Berlin (East) and the GDR took place at the traditional Berlin Cross Country Run on Teufelsberg. Participants from Berlin (East) and the GDR at the traditional Berlin Cross Country Race on Teufelsberg. the founding of the World Marathon Majors (WMM) … indeed, a Jack of all trades! For Horst Milde, the best praise he could receive is that he „turned the Berliners into runners or at least into spectators at the Berlin Marathon.” He is always bubbling with ideas, creating a supporting program that has long become standard for modern running events: e.g. an interdenominational service, marathon mass, a children’s painting competition, school mini-marathon, children’s bambini run, a Jubilee Club (participants who complege the Berlin Marathon 10x), massages and showers at the finish, an emergency rescue system with defibrillators along the course, a physicians‘ symposia, a runner forum in the FU Berlin, surveying seminars, historical exhibitions at the Berlin Sports Museum, and a literature marathon. Special events he organized include the 3rd AIMS World Congress in Berlin in 1983, various AIMS Board meetings and the first Regional AIMS East and West European Meeting of Running Organizers on September 27-28, 1993 in Berlin. During his leadership at the Berlin Marathon, some of the innovations worth mentioning are the medals he introduced at the Berlin Marathon, which are dedicated to Olympic champions, with their portraits appearing on both the medal and the certificate. Two of these Olympic champions have fired the starting shots at the Berlin Marathon – the 1936 champion in Berlin, Son Che Chung (KOR) and Emil Zatopek (CZE). Milde provided inspiration for modernizing the marathon event at the World Championships and the Olympic Games, when he suggested to the IAAF to make it a multi-round course through the city centre, close to the general public – and idea that was ultimately realized at the IAAF World Championships 2009 in Berlin and later at the Olympic Games in London 2012. And he is also the largest collector for Berlin’s Olympia Park-based Berlin Sports Museum, the AIMS Marathon Museum of Running – Marathoneum. Great exhibits and collections from running and athletics are brought together by this initiative, which is unparalleled worldwide, and which provides a treasure trove for later generations. Horst Milde has headed German Road Races (GRR) from its creation, as a second spokesman and for over a decade as chairman. During this period, GRR developed into the „voice of running sports“ in Germany, getting involved and speaking up with critique as necessary. It successfully prevented the “running toll” planned by the DLV, which failed after resistance from GRR, thus helping German organisers avoid higher costs. GRR also successfully advocated for fairer qualification times and nominations of German marathon runners for the Olympic Games and European Championships. the Award for Groundbreaking Events. Through its German and English articles, the GRR website has developed as an important partner for the exchange of information throughout “running” foreign countries – and is thus also an ambassador for German races abroad. GRR has developed successful cooperations with neighbouring countries Switzerland (Swiss Runners) and Poland (Polskie Stowarzyszenie Biegów) in order to intensify the exchange of runners among neighbouring countries. Currently, as a Berliner, Horst Milde is using the GRR website as a mouthpiece for the preservation of the „monument“ of the Berlin Olympic Stadium. It ought not be converted into the football stadium for a Bundesliga club and thus be lost for athletic events. For his high achievements in the running movement, he was awarded the „Merit of Honour“ of the International Athletics Federation (IAAF), the German Federal Cross of Merit and the Order of Merit of the State of Berlin. Despite having a full-time job with intensive research required for the bilingual GRR website and his work as GRR Chairman, while also looking after the five grandchildren of his three children Karsten, Mark (he is now the successful race director of the Berlin Marathon) and Gesine, there is also time to relax in the theatres and concerts of Berlin’s rich musical life with his wife Sabine – who supported him at work in the family bakery-pastry shop (since 1903) so that he could pursue his time-consuming „hobby“. Sabine Milde has also successfully completed several marathons. Needless to say, the jubilarian keeps himself fit through regular morning runs through Tempelhof’s parks, streets and gardens and by cycling at the park at the former Tempelhof Airport, Tempelhofer Freiheit . After all, even in old age one ought to be a running role model. German language can be translated into the national languages.